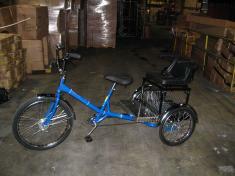 We are please to introduce the newly revised Family SINGLE Chariot Mover Trike. Now better than ever! 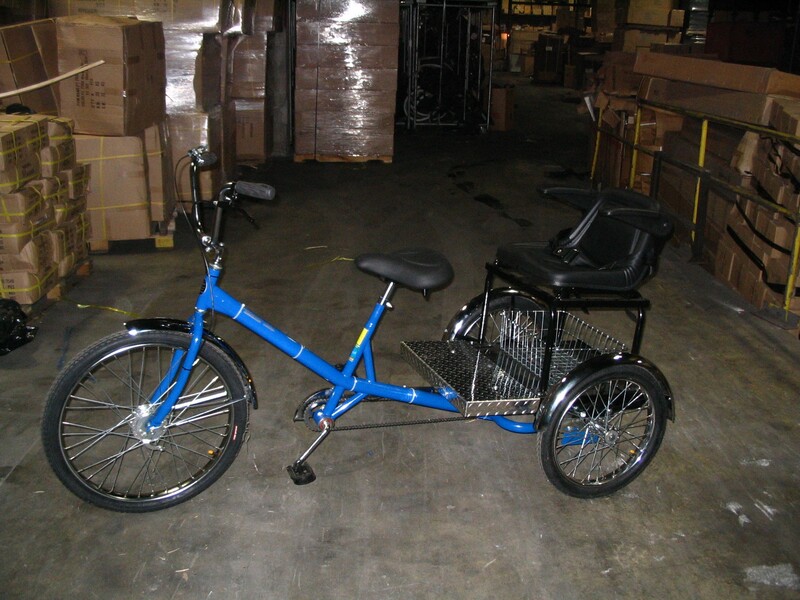 Imagine doing your errands, or riding through your neighborhood along with your child (or other passenger) on this unique and durable vehicle. All the great features of our classic Mover M2620-3CB combined with a special seat for your passenger (up to 5'9"). THE MVPC-3CB comes with the following standard features: 3 Speed coaster brake, Front Drum Brake (with parking brake), Front and Rear Mudguards (fenders), thickly padded wide saddle, rear basket, thickly padded high back child/tractor seat with lap belt and swivel down armrests, WTC clincher wheels, 11 g spokes, 7/8" axle and all the heavy duty features that make Worksman Cycles the most respected tricycles on earth. Whether it is just for fun, exercise or for practical transportation, the Worksman Single Chariot is a great solution for a safe, secure experience. Share those special moments with your child, friend or parent, and get exercise at the same time. It's good for both of you! Pros: The Family Single Chariot is everything that I expected! I also ordered the small chain wheel for the lowest gearing and it's perfect! The heavy duty fat tires are excellent. The 3-speed hub is just right! The extra wide saddle is very comfy. The standard yellow looks great! And of course, chrome plated fenders add the finishing touch of sparkle. Cons: Just a couple of mistakes. The assembly person made a ding-dong mistake... the seat mount was installed backwards. So I un-bolted it, and while it was off I noticed that the drilled holes were very rough and had burrs, so I countersunk them with a hand countersink and bolted it back together properly (easy fix, I grew up in an old school machine shop). I added some cushion material under the aluminum deck while I was at it in order to stop the rattle as aluminum is very loud. YES! I recommend Worksman Trikes, and I haven't driven a car since 1994. And I've been using their 26-inch drum-brake wheels on my motorized bike since 2003. Soooooo, I bought this trike about a year ago. It's beautiful! I have it in purple. It's super comfy...if you're in the back but I'm the stroker. My daughter enjoys being ridden around and we turn a lot of heads. We don't ride it very much now though because it is VERY heavy. We got the electric one to combat that but our battery died so it's an expensive dust collector. We live in a semi hilly area. (very gradual hills but they are killer) I plan on replacing it but haven't brought myself to spend the $150. The folks at the shop are wonderful. Very friendly and accommodating. I bought this for my special needs daughter and me. They even threw in a bell, mirror and whitewall tires! Worksman makes a great product. I did only rate a four because of the battery but that's fixable. Please see the color chart for color swatches.